Amyotrophic lateral sclerosis (ALS), also known as Lou Gehrig’s disease, is a neurodegenerative disease in which motor neuron (MN) loss in both the spinal cord and motor cortex causes progressive paralysis, muscle atrophy, and death. So far, only a few drugs have been approved by the U.S. Food and Drug Administration as symptomatic therapy for ALS. However, existing drugs lack effectiveness and only a limited number of drug candidates have been evaluated for the treatment of ALS. Fig. 1. Proof-of-concept of drug screening with muscle readout for neuromuscular disorders. A major reason for the lack of existing therapeutics is that the current, traditional drug development process (2D culture model followed by animal experiments ) is highly inefficient. Indeed, although these traditional in vitro culture methods have led to important findings related to ALS, the lack of a screening model that mimics the disease in humans has severely limited the ability to identify new drug targets. We proposed a new strategy for mimicking the physiological and pathological neuromuscular organ system using “Organ-on-a-chip technology” to apply drug screening for a neuromuscular disorder such as ALS (Fig. 1). 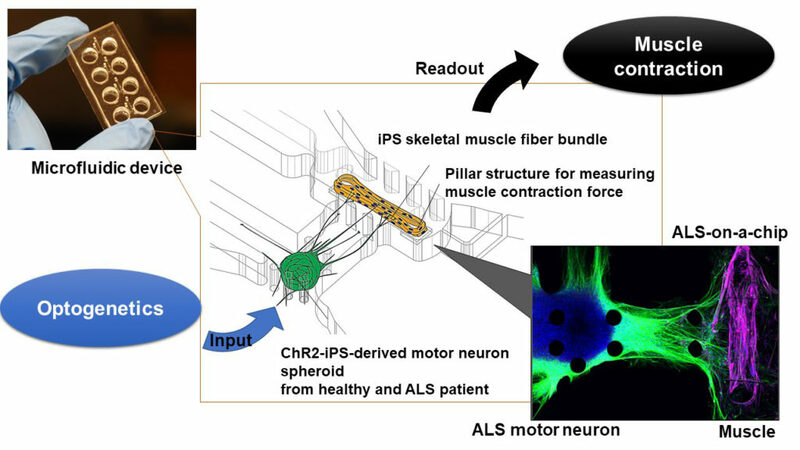 With this new approach, we established two models, one of a healthy human motor unit using non–ALS patient–derived MNs and iPSC-derived skeletal muscle cells, and another in which the MNs were derived from an ALS patient. The motor neurons used in this work were transfected with channelrhosopsin2-[H134R], a light-activated ion channel that can be used to control neuronal activity. This optogenetic technique is a very common and useful tool in the field of neuroscience. By means of this optical stimulation, the signal from MN is propagated to muscle bundle through the axon and neuromuscular junction, causing the muscle to contract. We can measure this muscle contraction force and synchronization of the optical stimulation and muscle contraction as readouts of muscle health. Muscle contraction was calculated with post-image processing by the displacement of 3D pillar structure by muscle contraction. Using these two parameters, we can predict the condition of the MN, muscle maturity, and the connectivity of the two tissues. In addition, drug candidates can be tested with this disease model by the administration of new or existing drugs. In this paper, we found that two drugs “Bosutinib” and “Rapamycin” and their combination improved muscle contraction force and MN-muscle synchronization in the ALS motor unit. In so doing, we were able to replicate the recovery of MN observed in traditional but more complex and costly animal experiments. Our findings using our ALS-on-a-chip model support the potential of these drugs, especially in combination. This drug screening method is novel in that the traditional model for drug development only considered the health and function of the neurons and/or motor neurons. No previous studies investigated the effects on skeletal muscle nor and the interaction between MN and skeletal muscle cells in the drug screening process, despite the fact that ALS is known to be associated not only with motor neurons but also skeletal muscle. In this study, we used normal human-derived skeletal muscle tissues. If we instead use patient-derived skeletal muscle cells, we believe that our model could be applied not only to neuropathy (such as that associated with ALS and spinal muscular atrophy) but also to myopathy (such as that associated with Duchenne muscular dystrophy and myasthenia gravis). By forming patient-derived muscle fiber bundles we could investigate interactions between muscle atrophy and MN activity enabling drug testing for these diseases, as well. Lastly, because Alzheimer’s disease, Parkinson’s disease, and epilepsy have been associated with loss of muscle strength, coculture with iPSC-derived cortical neurons from these patients might facilitate investigation of the relationships between these pathologies and muscle strength. Microphysiological 3D model of amyotrophic lateral sclerosis (ALS) from human iPS-derived muscle cells and optogenetic motor neurons.